Who doesn't like to bite into a yummy baked good and find a yummy surprise inside? Not only are these muffins topped with cinnamon and sugar -- yum! -- but they have a jam filling -- double yum! I adapted this recipe from Taste of Home. I think the next time I make it (and there will be a next time very soon!) I'm going to leave the cinnamon and nutmeg out of the batter. The muffins taste great as is, but I think leaving the spices out will give the muffins more of a "doughnut" flavor. In a large bowl, combine flour, baking powder, salt, nutmeg and cinnamon. In a small bowl, combine sugar, oil, egg and rice milk; stir into dry ingredients just until moistened. 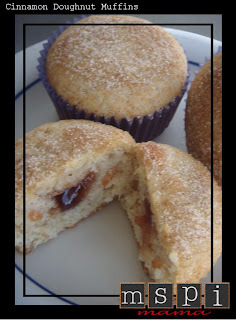 Fill greased or paper-lined muffin cups half full; place 1 teaspoon jam on top. Cover jam with enough batter to fill muffin cups three-fourths full. Bake at 350° for 20-25 minutes or until a toothpick comes out clean. Place melted margarine in a small bowl; combine sugar and cinnamon in another bowl. Immediately after removing muffins from the oven, dip tops in margarine, then in cinnamon-sugar. Serve warm. Yield: 10 to 12 standard-size muffins. Tip: Do you ever have problems with your muffins sticking to the paper liners? Before pouring the batter into the muffin cups, spray the liners with cooking spray. After cooking, the liners will pull away from the muffins cleanly! Just made these with blackberry jam (and without nutmeg because I didn't have any). My husband and I thought they were amazing! Thanks for helping to make this MSPI diet tolerable. Just made these for Easter breakfast!! Delicious! My husband and I loved them, and I'm sure my kids would have too if they weren't so hopped up on candy!